A cup of prepared guacamole gets a cheesy boost from a blend of cream cheese spread and shredded cheese to make this quick and easy appetizer dip. 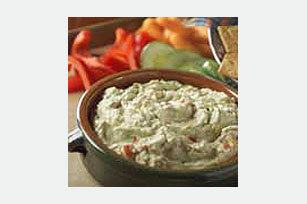 Mix cream cheese spread, guacamole and shredded cheese until well blended; cover. Save 3g of fat and 2g of saturated fat per serving by preparing with PHILADELPHIA Neufchatel Cheese; KRAFT 2% Milk Shredded Reduced Fat Cheddar Cheese and reduced-fat thin wheat snack crackers. Cover and refrigerate any leftover guacamole. Use as a bread spread for sandwiches.